The killing comes while the SL military has stepped up harassment of former LTTE members, especially before the Tamil Eelam Heroes Day on 27 November, the sources said. 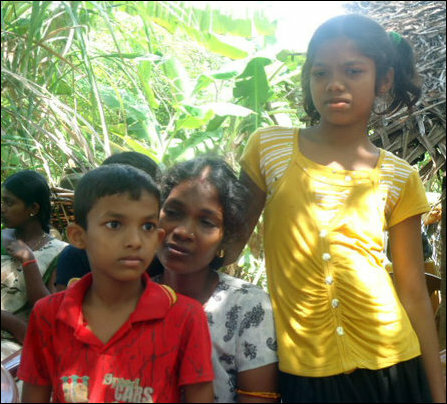 Nakuleswaran was released on 24 December 2012 after prolonged SL military custody following the genocidal onslaught on Vanni. More than 200 SL military personnel were deployed at the settlement of Easan-kudiyiruppu at Kaneasapuram of Ve’l’laangku’lam on Thursday. There were many intelligence operatives at the site and the SL soldiers didn't allow external visitors to visit the house of the victim. A week ago, two unknown men had come asking for Nakuleswaran, according to the mother-in-law of the victim. Nakuleswaran had no known enemies, his wife, Kavitha, who is a teacher at the Ve'l'laangku'lam Tamil School said. In the meantime, Sri Lankan military intelligence has deployed civil officials working under the SL Ministry of Resettlement, to collect particulars of the ex-LTTE members who are re-united with their families. The officials visiting the settlement had also instructed the former LTTE members not to change their mobile phone numbers without informing them.